… but fortunately it’s way too hot to bake. If it wasn’t, I’d bake this cake. I’ve had a good few days, first my bathroom is almost finished, hopefully I’ll be able to post the full saga shortly. 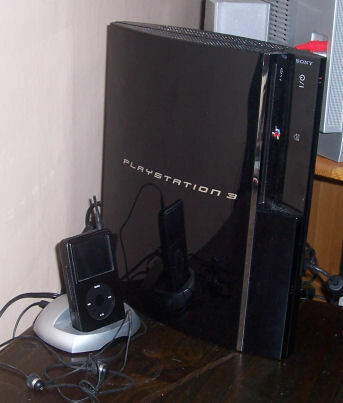 It’s the PlayStation 3 that’s new, the iPod just crept into the photo because it was jealous. I’ve only played with it briefly but it’s a pretty damn good machine, it’s insanely easy to set up and it’s now happily talking to the Internet and streaming stuff from my server via the magic of TVersity. It’s the 60Gb model (off eBay) so it plays old PS2 games although I have to get a converter if I want to grab my old data off the old memory cards. That’s not all, over the weekend I won a raffle, netting me both a hamper of Mexican goodies and tasting menu for two at Le Trois Garcons. Spot on. Finally I played a nice friendly game of poker at the weekend. I won. I won even when I was trying to lose. Posted in Food, Life, Tech | Comments Off on Everything’s coming up SpaceDog! Sometimes, it’s better to fry it. One ring on my cooker is stuck permanently on a medium-to-high setting, I’m coping with it (and it’s getting replaced soon) but I feel bad when I switch on the cooker and don’t use that ring. Think of my carbon footprint! Today I needed to heat up a couple of pita breads, but I didn’t want to use just the grill and waste the hot ring. So I opted to cut the pitas into thinish slices, fry them in butter, flip ’em, drench them in Parmesan (still in the pan, let it melt over them), and drain on a kitchen towel. Throw over a bit of salt. Amazing. Sometimes, it really is better just to fry it. Posted in Food | Comments Off on Sometimes, it’s better to fry it. I saw the headline “Snowflakes promise faster chips” in BBC News and immediately assumed they where going to use snow flakes to make the process of cooking chips faster. The article was about computer chips, of course. You’d think the ten years working with computers would’ve managed to displace the ‘fried food’ definition of chip from the top of my mind. Or perhaps the stupidity of deep frying snow might have been a hint. But no. Food first it seems. And that’s after lunch. Don’t forget to vote if you’re in the UK. I’m all for people creating new and exciting dining experience but we have to draw the line somewhere. I would have drawn it before suspending a 22-seat dining table 50 meters above the ground. The questions raised (ha!) are almost endless, but they start with just “Why?”. Is the menu full of ‘flying’ puns? What happens if you drop something? Do they cook the food up there or fly it in? If you rent it for eight hours, does it land every time some one wants to go to the toilet? Again, just “why?”. And worse, does this raise the stakes? What’s next? Supper in space? Strap skies onto a table and chairs and have bit of snack? Watching TV earlier this week I was appalled by an advert for the Tassimo coffee maker, sorry, coffee system. I’m not annoyed by the stupid name, the annoyingly stereotyped adverts, or the fact that the machine is just an attempt to tie people to one manufacturer by combining the freely available coffee, milk, and whatnot in one machine-specific proprietary one-use over-priced cartridge. That’s fine, I’m happy not buying one. I’m sure it fills a niche. No, what annoyed me is that apparently the Tassimo is Product of the Year, at least in the field of drinks equipment. Now, I’m not annoyed by the fact that it’s a pretty lofty claim for a kichen gadget that’s not even very original in it’s field, nor am I annoyed that Cillit Bang is nowhere to be found in the cleaning products section. I’m not even annoyed by the fact that the Product of the Year badge is a badly disguised marketing gimmick where you pay for consideration by the public (well, the 12 thousand or so who can be arsed to return the form) and then pay if you win. No, the thing that really tweaked me off was that it’s Product of the Year 2007. Eh, I had to check the calendar to make sure I hadn’t slept for nine months. It’s a bit premature to be handing out the 2007 awards, no? How’s your typical wacky inventor going to feel when, after perfecting a machine that converts household waste into the delicious beverage of your choice, he realises he’s playing second fiddle to a glorified vending machine? I urge everyone to brandish their biros and insert the phrase ‘the first quarter of’ into the logo wherever they may see it. (Probably best not to do it if it’s you’re seeing it on a website or a TV advert, you’re just going to get ink on your screen). I tend to have a bit spare fruit lying around, so I’m fond of trying to do new things with it before it goes too ripe and mushy. This led to me throwing bits of banana in the pasta sauce I made tonight — it was interesting and I think that the right blend of bacon, tomato, banana and chilli might have the makings of something really special. Or maybe I’m just odd. That’s the sort of inanity that you’re spared when I decide not to post anything at all. There’s plenty of that already on the web, hell if that’s your bag then there’s a new site dedicated to it. So, there’ll be more posts when something moves me to post. Or when I perfect my chibactomban sauce. Since I’ve now got the last thing I wanted, it’s time to for the materialistic part of my mind to focus on something else. I’ve seen this before but previously it was only available in America, once again FireBox comes up with goods and are offering it over here. I’m not actually sure how much I’d use this since I don’t eat a lot of Ice Cream, but it’s just so damn cool (no pun intended) that I want one. Just don’t put your hamster in it by accident. They took the trophy with a traditional steak and ale pie. Although it’s seems slightly unfair to win a world cup based on pie sales from an outlet that only sells in England. Some of the other pie fillings sound good, kangaroo in merlot, beef stroganoff, or chicken with plantains would all make a tasty pie. I’m forced to wonder what pie Scotland would field if they made the next world cup (stop laughing, they might). I guess the obvious would be a traditional scotch pie, or haggis, neeps and tatties, although haggis in whisky sauce might make a better filling. You could go a more eccentric route, cullen skink pie, arbroath smokie pie, or maybe porridge pie. Hmmm, it might be worth actually trying some of them but it’s far too hot to have the oven on. Perhaps I’ll have a pie party when the weather cools down … fear my freakish fillings.